Meet Hal (Christopher Plummer), his son Oliver (Ewan McGregor), and Oliver’s new girlfriend Anna (Melanie Laurent), they are all beginners. In what? In matters of Love and Life. 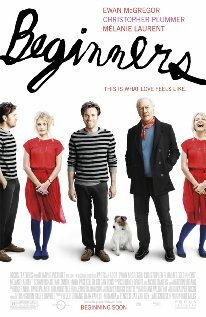 Beginners, Mike Mills’ second feature-length film, is a movie about the importance of the choices one makes to fill life with joy, rather than sadness. It tells three stories in three different timelines, interwoven with each other. The fil rouge that links each story is Oliver, a 38-year old artist. Through his eyes and voice (and the use of some clever graphics by the director), we go back and forth in time: we are shown glimpses of Oliver’s Mom and her unhappy marriage with Hal, a museum director and a closeted gay in a society that considers homosexuality an illness in desperate need of a cure; after his wife’s death, 75-year old Hal decides to begin a new life, we see him finally embracing his homosexuality freely and unabashedly; the third story is about Oliver himself: few months after his father’s death, still mourning for his loss, he meets Anna, a French actress, at a costume party. It is a particular moment in Oliver’s life, he’s trying to make sense of his own past, his own present, and decide which shape to give to his own future. At the centre of the movie is the idea that is never too late to come out of the proverbial closet and try (more or less successfully) to be happy in Life. But the film is not just about being gay (or not), that is just one thread in the movie. The closet here is extended figuratively to all those people who for reasons often unknown, perhaps fear of failure or fear of being hurt, live lives of emotional dullness and never commit to anyone. 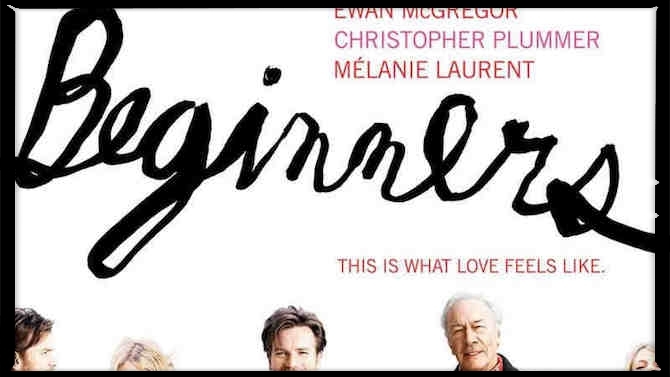 One could easily describe Beginners as a light-hearted feel-good-movie with some kind of happy ending attached to it, but that would be a far too narrow definition, somehow limiting the film’s scope and quality. This isn’t really a comedy. On the other hand, this is not a tragedy. Throughout its length Beginners remains always conscious of what it is not. Mills and his cast are wise enough to never attempt to turn the movie in some sort of philosophical treatise about the film’s subject matter, so they never make the mistake to take themselves too seriously, at the same time, keeping a good balance between laughter and sadness, and staying at arm length from the pitfalls and cliches of the gay-genre, the movie never undermines its core cinematic value. Notwithstanding the film’s general release coinciding with the week preceding the Gay-Pride celebrations, it is not among the aims of Beginners to attempt to stir any kind of new social debate on gay-rights, integration and, further on, the death of creativity in capitalist-societies. True, the plot touches upon these important themes, but it does it with a consistent and uplifting lightness of touch. Overall, I consider Mike Mill’s Beginners a delicate and charming, at times poetic, here and there quite funny speculation on life, love, and the hard matter of human relationships. It deals often with tragic matters, but thanks to its tone, acting, graphic choices and direction, not to mention a solid script, while asking some interesting questions the film ends up putting a smile on our faces, albeit at times that smile has the bittersweet taste that is proper of life. Browsing the movie’s website, I read the story is inspired by the director’s own family history. Mills’ father, himself a museum director, followed a path similar to Hal’s. Perhaps the close understanding of the subject lends to Mill’s writing and direction even more assurance. In the wrong hands this movie could have easily been excessively light or excessively sad and boring, instead Mike Mill’s skills and an excellent ensemble of well cast actors make Beginners a truly enjoyable experience, a movie definitely worth watching. The background story of Beginners, the unhappy marriage of Hal and Georgia (Mary Page Keller) is told in fragments. They were married for almost forty years, then, six months after Georgia passes away, Hal tells his son: I am gay. This is only a revelation for Oliver, as Hal and Georgia had always known. But the 50s were hard times for homosexuals in the USA: the analyst tells Hal his condition can be cured, his wife tells him: “I will fix it”. For forty years Hal lives his life escaping his own true-self, trying to fit within a society that doesn’t accept him. The result is unsurprisingly far from perfect: an absent father and husband, a sad wife and an introvert kid that spends what it seems to be quite some time taking care of his mom. In the bits of the movie that concentrate on Oliver’s childhood memories, Mills focuses only on Oliver and his melancholic-odd-behaving mother. Hal is a figure seen from behind or he is represented in absentia by his museum and his art exhibitions. After Georgia’s death everything chances. Hal’s new-beginning as a gay man and then his hopeless fight with cancer give a second chance to the two men to build anew their relationship as father and son. Suddenly, Hal becomes a fulfilling presence in Oliver’s life and vice versa. At 75 Hal finally finds a way to a happiness that he had never thought possible. The final years of his life are a great lesson for Oliver and for the audience. Hal is a liberated man, he is not devoid of flaws but he has a strong attachment to the fullness of life, even when confronted with the inescapability of death. Oliver, on the other hand, is an introvert; an artist who has gained some fame with his previous work and now everyone wants him to do the same thing over and over again. He is trapped in his past and doesn’t know how to move forward. 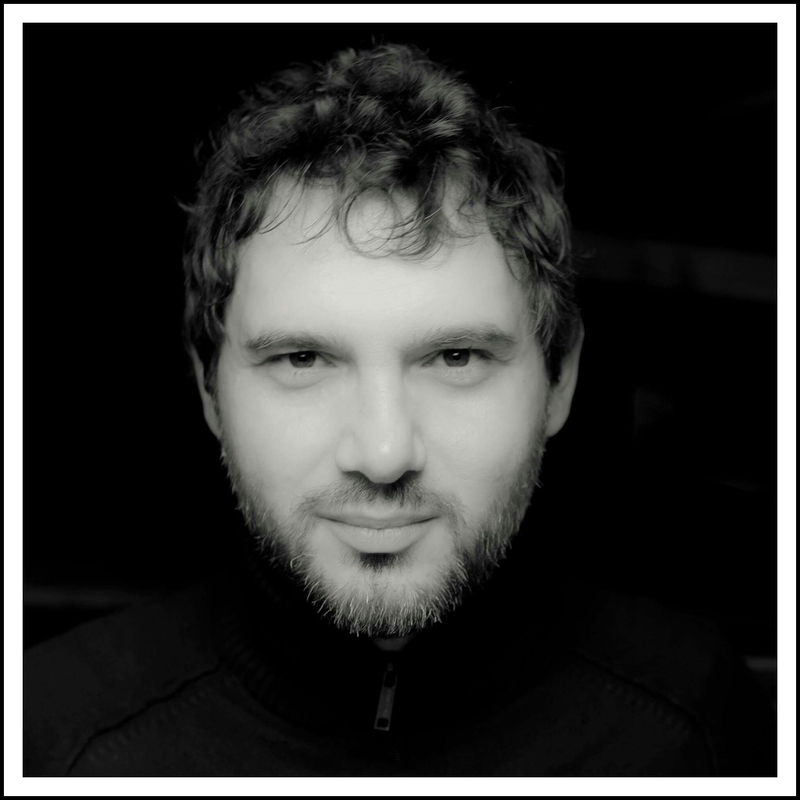 The memories of his father and of his mother inspire him a new project, a graphic representation of the history of sadness. The drawings are funny and lend a touch of lightness to the subject. Yet neither Oliver’s clients, nor his partners seem too keen on it. Oliver is also the kind of person who has never committed to any relationship; in fact he always breaks away from his girlfriends when all gets too serious. Hal’s departure is a great loss for him. Hal’s experience, with its joys and failures, casts a different light on Oliver’s life and makes him questions the choices he has made thus far. Then he meets Anna. Anna is a French actress who lives between a hotel in Los Angeles and a little unadorned flat in NY. She, like Oliver, has never committed for too long to anyone; she prefers Hotel rooms and their sense of ungrounded fleetingness to anything that is more real and rooted. Her own father, contrary to Oliver’s, is a haunting figure that adds to Anna’s life another reason to escape: we never hear him talking, and we only hear the ring of his persistent telephone calls: he calls Anna to confess her the suicidal wishes he cannot confess to his wife. When he meets Anna at a costume party, Oliver is dressed as Freud and she cannot talk because of laryngitis. She speaks by means of scribbling notes on a little notepad. Her silence however sounds like the echo of Oliver’s consciousness, she seems to know what he thinks and feels. When she finally starts speaking she adds to Oliver’s life a new layer of complexity: they seem to like each other, very much, but nonetheless they are unsure where to go from there. Pointedly, the dog Arthur, an important character in the movie, asks a few times: are we married yet? Arthur is Hal’s former dog, now in Oliver’s care. He deserves a special mention. He does not speak, but he communicates, as only dogs can do, with his eyes, his tale and, (a clever move from Mills) with subtitles: his one-line sentences give the director a chance to lighten the mood in many scenes, to clarify the matter to its bare simplicity, and they give us one more reason to smile. Arthur is a reminder for the audience that this is a good story where (almost) no one ends up sad and down. Death (simply understood as the opposite of life) plays a small but important part in the movie. In Beginners death is depicted as melancholic rather than tragic, it is a fact of life, the inescapable end of the journey that each and every one of us must face, soon or later. A terminal illness is never the best way to face such an end, but in Mill’s recounting the illness gives way to the joy of life and love. The scenes dealing with Hal’s final months are framed with kindness and tenderness (a son reading a book to his father, a young lover kissing repeatedly and affectionately his much older and dying partner) and the small joys of life (a party among friends, a shopping spree in a bookshop). In the context of this movie Stage 4 cancer is not as Oliver points out a sign of hopelessness: “there is no stage 5 dad!” In fact, for Hal it means something else: Stage 4 means one has been strong enough to go through three previous stages of a terminal illness, and that is no little consolation. Tragedy, on the other hand, is somehow present in Beginners only through its absence. It’s best epitomised by the character of Georgia. We don’t see much of her, we only see her in fragments taken from Oliver’s childhood memories. We don’t see Georgia’s later life with her husband or her death. But from what we glimpse, Oliver’s mother appear to have never been truly happy and we can only assume that she lived an embittered life throughout her whole marriage with her gay husband. Her perseverance in trying to fix her husband’s illness and Hal’s perhaps lack of courage in taking control of his own life sooner cost both of them almost 40 years of their lives. Those wasted years are the real tragedy. The absence of the scenes from Georgia’s life and death is a wise move by Mills, if he had shown us more it would have changed radically the otherwise optimistic mood of the movie. Such absence is perhaps the reason why the overall lasting impression Beginners left me with is that of a feel-good movie, one were the likes of Frank Capra and Jimmy Stewart would have felt much welcome if not at home. The acting never looks adrift. The overall atmosphere is light and melancholic; the mood in the scenes about Oliver and Anna reminded me of the best bits in Lost in Translation. McGregor and Laurent are well cast and show good chemistry. Mary Page Keller as Georgia is excellent. Christopher Plummer is at his best, not far from the heights of Ian McKellan’s Jimmy Whale in Gods and Monster and Peter O’Toole’s Maurice in Venus. We all live in some sort of closet. Some of us never get out of it and, like in that famous video by The Cure, end up down a cliff. Others, like Hal, Oliver and Anna are brave enough to break its doors and set themselves free. It is never too late to try. Beginners is perhaps far from being an instant classic, nonetheless, in this Summer full of brainless blockbusters, this is definitely a movie worth watching.